I do not post many “cheffy” dishes on this site. For every venison with elderflowers or stuffed duck legs lurking around in the more than 350 recipes I’ve posted to this site, there are scores of more accessible dishes. I do this for several reasons. First, I really do want you to be able to recreate my food. Second, it is far harder to nail a cheffy dish than it is to make a good chili, or a perfectly seared piece of fish. That does not stop me from making this kind of food with some frequency. You might ask whether a beautifully prepared and plated fancy dish is any better than a wonderfully tasty bowl of soup, or a simple venison steak? Not necessarily. But the difference, what keeps me pushing, is that the cheffy dish is almost always more original; new textures, colors, flavors. It is a way for cooks to stamp their own mark on a plate of food. Yet, for me at least, making this sort of food is almost always a case of ski fast, fall hard. My notebooks are loaded with ideas that are almost there, but not quite. Case in point. 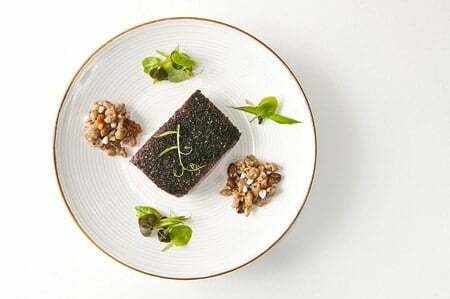 About a year ago, I got a piece of bear meat and I designed a beautiful dish around it. Cork had shot the bear in Northern California, and I would pair the meat with ingredients from all around where that bear would have lived: Acorn spaetzle, black walnuts, gooseberries, miner’s lettuce, wild onions. I’d cook the bear sous vide and top it with a mixture of ground black trumpet mushrooms and smoked salt. It looked beautiful. But the piece of bear I had was a roast, not a tender cut. I am inexperienced cooking bear, so the texture of it was off. Chewy. And what’s more, the dish did not eat like a unified plate of food. One of the best meals I had on last year’s book tour was at Chef Scott Pampuch’s The Corner Table. What made it such a special meal was Scott’s philosophy: No matter how cheffy you get, what you put in front of a diner needs to be a recognizable, unified plate of food. Not just a bunch of stuff on a plate. Words to live by. Flash forward to last weekend, where my friend Garrett and I had the chance to eat Chef Pajo Bruich’s food at Lounge on 20 in Sacramento. We powered our way through a 10-course tasting menu, and that menu highlighted what’s great — and so challenging — about high-end dining. Some courses were triumphs of flavor, but hardly original. Other courses were like my bear dish, pretty to look at but missing something. It wasn’t until we got to the desserts (there were two) where Bruich showed me something new that was perfectly delicious, a joy to look at, and was a cohesive plate of food. He nailed it. Bruich is very good at what he does, yet he still missed a beat here and there in that meal. This is how hard it is to make this sort of food. One wrong note in a 10-course symphony will ring in the ears louder than all that sweet music you heard in between. It is a high-wire act of the tallest order. For the most part, I stick to single dishes — songs, not symphonies. And for the most part, I fail. But, once in a while, I get lucky. 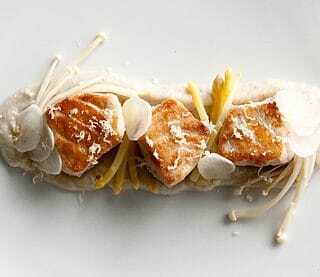 This dish, which I call “white sturgeon,” is a rock-solid hit. Why? I suspect it has something to do with the fact that I’ve been thinking about and tinkering with the elements in the dish for more than a year. 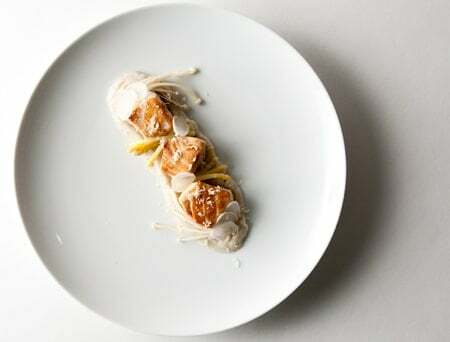 I like dishes with a sense of humor, even gallows humor, and I’ve joked about making a dish called “oppression” for some time: white asparagus, Belgian endive, veal or squab — all things that are forced, artificially whitened or literally oppressed. I never made that dish, but the idea of an all-white plate of food was born in my head. I’ve been tinkering with jerusalem artichoke puree for months. Getting the texture, color and flavor right where I want it to be has been a process. But I can now do it without thought. The white enoki mushrooms here are pickled. Boiled in rice vinegar, really. All dishes needs an acidic component, and doing this in an all-white plate requires some finesse. Pickling the mushrooms solves the problem nicely. 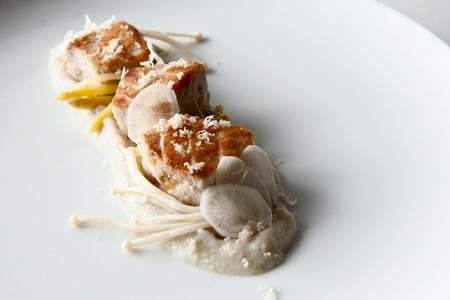 Each element on the plate is there for a reason: A rich puree with a little tang from sour cream, tart mushrooms, crunchy raw radishes, firm white asparagus and super-meaty sturgeon. Topping it all is freshly shaved horseradish. Everything works. Eat any combination of elements in any order and it tastes good. It is compact, pretty — and most importantly, it leaves you wanting more. This is neither an especially easy nor an especially difficult dish to pull off. Everything on the plate is cooked simply and separately, and it all pulls together quickly at the end. Think of it almost like a composed salad. The toughest part of making this recipe is getting some of the ingredients. Sturgeon can be tough to find, but swordfish is in most fish markets in the country. Buy North American-caught swordfish, which is sustainable. You can use any firm, white fish. California white seabass, tilefish, shark, paddlefish or even redfish would work. For the asparagus, bring a small pot of water to a boil. Salt it so it tastes like the ocean. Boil the white asparagus until al dente, about 5 minutes. Drain and toss with olive oil. Set aside. For the mushrooms, pour the rice vinegar and 1/2 cup water into the pot you cooked the asparagus in. Trim the root ends off the enoki mushrooms and boil them in the rice vinegar for 3 minutes. Cover the pot and turn off the heat. For the jerusalem artichoke puree, trim the 'chokes of any dark spots or dirt. You don't need to peel them if you don't want to. Add them to a pot of water and bring it to a boil. Salt the water well and simmer gently until the jerusalem artichokes are tender, about 30-40 minutes. Move the cooked sunchokes to a blender and add the sour cream. Puree. You may need to scrape the sides of the blender down to get everything into a smooth puree. Push this puree through a fine-meshed sieve and add salt if needed. Put into a pot set over very low heat and cover. For the fish, cut it into large cubes and salt well. Set a large saute pan over high heat for 1 minute. Add 1 tablespoon olive oil. While this is heating up, pat the fish dry with a paper towel. Set the largest, flattest side of the fish cube into the hot oil and sear, untouched, for 3 minutes. Turn the heat to medium-low and "kiss" the remaining sides of each fish cube for 30 seconds. You don't want the other sides to brown. 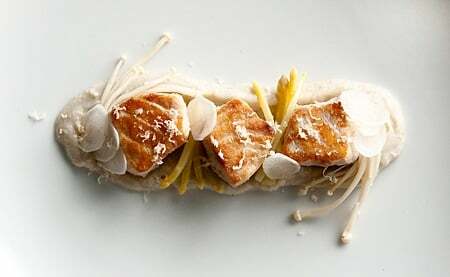 To serve, lay down some jerusalem artichoke puree and make a well in the center with a spoon. Place the sturgeon down, browned side up. Arrange the mushrooms and asparagus in between the fish, then place some thinly sliced radishes here and there. Don't grate the horseradish over the plates until they are all done; horseradish loses its flavor fast. Serve immediately. Enoki mushrooms are sold in Asian markets, and if you can't find them, use white button mushrooms. The look will be different, but you'll get the same flavor. White asparagus is available in decent supermarkets in spring; there is no substitute if you want an all-white plate. Jerusalem artichokes are available in some markets, but you can easily substitute potatoes. I don’t know much about Sturgeon, so found this really helpful. I’ll probably have to stick with the Swordfish. Beautiful looking dish. Nice to find your blog from Twitter.